This piece about HarperCollins allowing Neil Gaiman to offer one of his books for free online reminded me that I had a post to write about Egg, Bacon, Chips and Beans, the book. So here it is. I asked my agent (I know, I know) to talk to Harper Collins earlier in the year letting them know I was going to try and boost sales via the blog as a bit of an experiment and asking them if they would be willing to a) let me give away the book online b) let me have copies to give away and/or c) sell me some copies at a discount so I could give them away. They got back to us a while ago and said a) no. b) maybe, a few and c) no answer. Egg, Bacon, Chips and Beans is currently £6.59 on Amazon. (A bargain) And is currently ranked 181,230. I'm going to buy 20 at the end of the week, to use as blog promotional stuff. If anyone would like me to order them one as well then I will (I'll charge you via paypal) but I'll ship it to you free, signed, with an exclusive and delightful promotional badge and some random ebcb moo cards. Since I've already given an audio version of the book away once (ie you can listen to me read it out here) I figure I may as well do an electronic version as well. The only way I can think of for doing that is to use the various pdfs that I got to approve as part of the production process. I'm not 100% sure where they are but I'll have a root around on various hard-drives and see if I can find them. I'm interested to see if either of those activities does anything to the mysterious Amazon ranking, so I'll be trying to keep an eye on that too. Does anyone know of any automatic tools for doing that? Can I get a twitter feed of my Amazon rank? I can imagine a lot of authors understanding the need for twitter then. Otherwise I'll use screengrabs and flickr. This is just a PR suggestion, but you could free "walks" around the best caffs in London, and maybe try and get them (the walks) listed in the Events sections of local radio and newspapers. Also maybe do some point-of-sale for each of the caffs mentioned as the majority of people who are likely to buy the book are probably already using caffs. POS doesn't have to be too fancy. You might also consider selling the books through the caffs on a profit share basis. Anyway, I would definitely buy up the stock before they are remaindered. 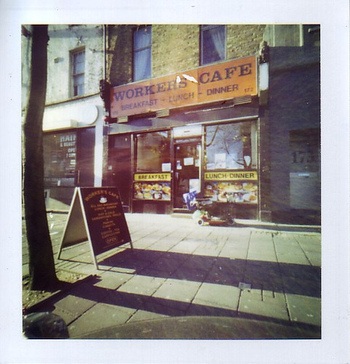 Oooh, Worker's Cafe on Holloway Road. I've tried a couple of trackers although mostly focussed on sales from amazon.com. However: http://www.salesrankexpress.com/ can be pointed at the UK site, and I see they've added a widget so the sales rank can be made visible on a blog. hey russell, i'd be interested in one of those books. how can i find your paypal? How about addressing this situation? "Publisher: learn how customers can search inside this book." Maybe if people can take a look at what's inside and get a taste of it, more of them will buy it. I would love a signed copy of your book. A great valentines day gift for myself! EBCB is now n° 30901! proud owner of an EBCB book since 2006. I'll have one, but I live in Germany - you still willing to ship it there/here? (Not sure of my location here in blogland). Made a pledge to start supporting more entrepreneurial small business folks this year. I suppose you count. Sign me up - mind shipping across the ocean? Happy to pay the extra postage etc. I would love a book too! Although i'm also living in Germany and happy to pay some extra postage... where do i sign?